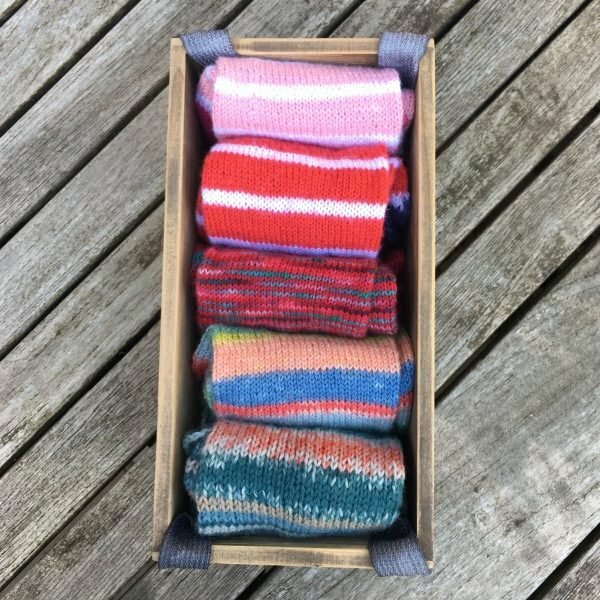 There have been many surprises in 2018, including how much I have enjoyed knitting socks – socks rock. 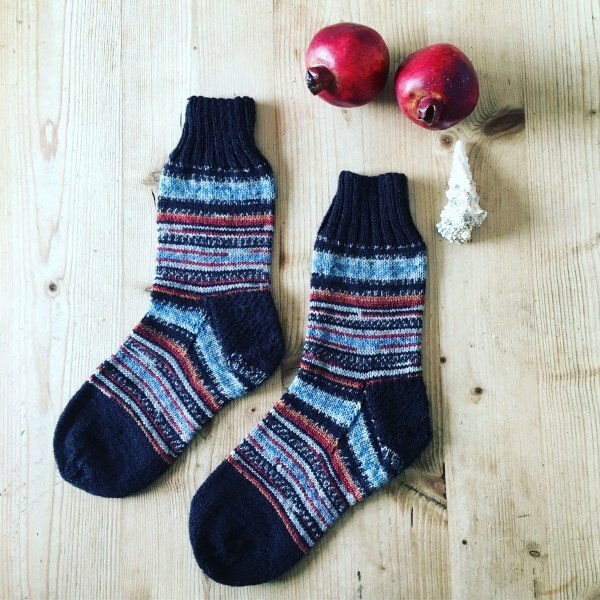 You know, prior to my little adventure with Arne and Carlos and learning how to do an ‘after-thought’ heel I would never have considered knitting sock at all. I mean, why would you? But it was my darling friend Christine (Winwick Mum) who helped me see the light. She showed me how easy it was to take a little sock project with you where-ever, when-ever you go. It does not take long before you have a pair. Doing a quick totting up I have made precisely seven pairs and I have two pairs currently on the needles. Four of those pairs have been for the men in my life. 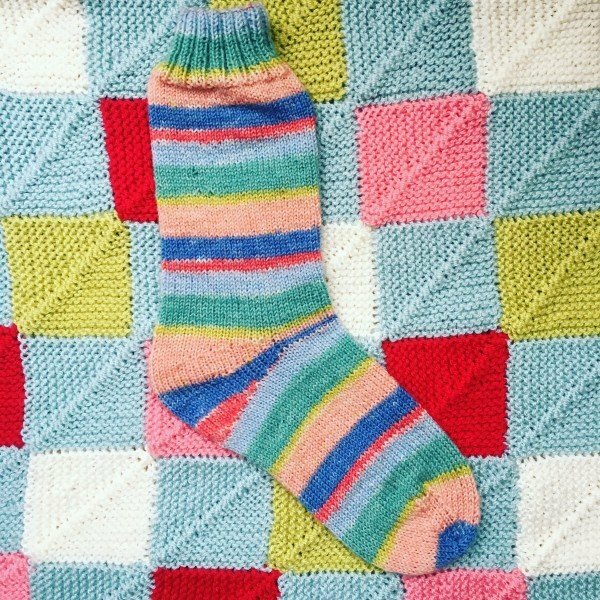 My first pair of sock were made for Little B (he is now larger than me, I need to rethink his blogging alter-ego). These are made from a soft 6ply weight yarn. They tend to get used more like a slipper or bed sock. I used the Regia Arne and Carlos Design Line yarn I got from the workshop I attended at Black Sheep Wools, they wash well and now are very soft. This colourway is Summer Night. He also has a luxury pair using a finer weight. I foolishly took him to visit the exclusive Countess Ablaze emporium in Manchester and he chose a sock yarn which looked very beautiful on the skein. This is a LUXURY PAIR. I believe that the colourway is Goodbye Yellow Brick Road. The colours in the store really appealed to B’s taste, they felt modern and exciting to him. 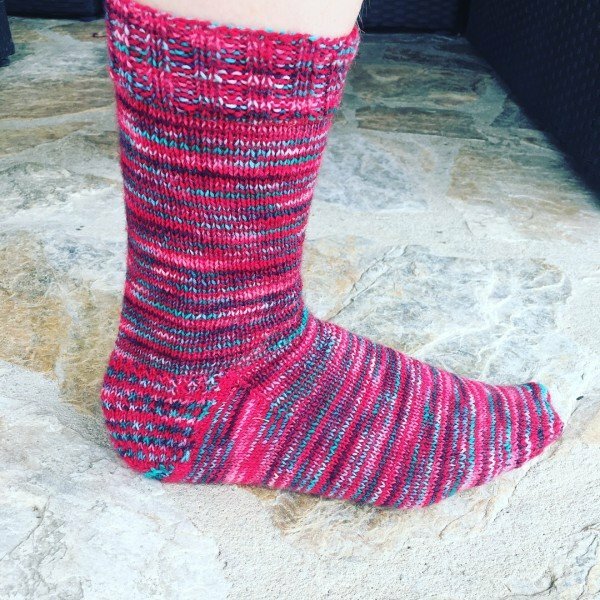 I actually finished knitting this pair in July on our hot-hot holiday in Majorca. The poor boy had to model his new socks in 35 degrees heat. Well, if you get expensive threads you need to suffer for your art! I made a rather smart pair of socks for my Dad. This pair is another design from Arne and Carlos for Regia. 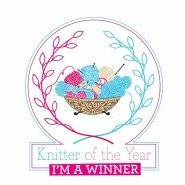 The Pairfect Sock Yarns are very clever the colours are spun to ensure both socks are exactly the same. I am not sure when he will wear them, but he knows that love is knitted into every stitch. This design colour is Fall. I made a lovely pair of blue socks for my blue-eyed boy; Big B. This sock yarn is by Stylecraft, Boho Head over Heels in Danube. I think this pair will get more wear as the Winter develops. I am sorry I haven’t taken a photo of the heel but I used the after-thought heel method from Coop Knits book; Socks Yeah. There are some lovely designs in this book, I just wish I had more time to make them. So now going onto my own socks. I have made two pairs using my own colour recipe with West Yorkshire Spinners 4ply Signature yarn. 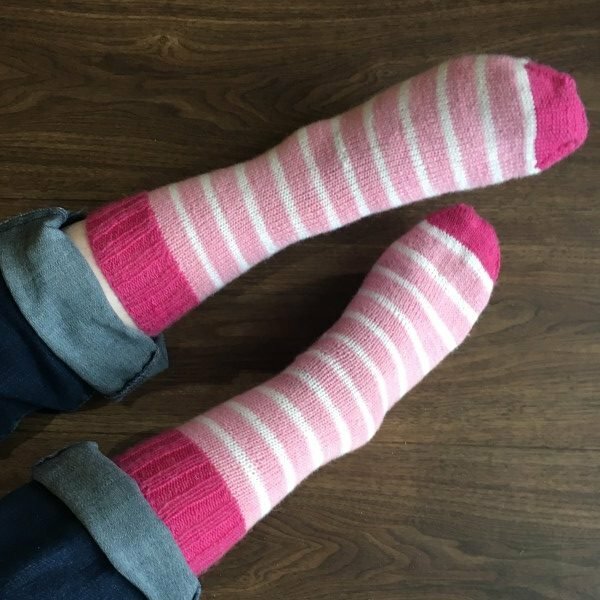 A red striped pair, and a pink pair. 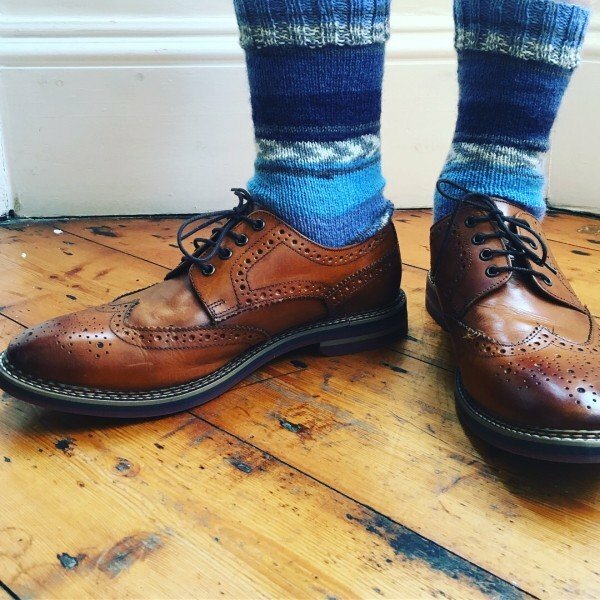 My own personal choice would be to have a deep ribbed cuff on the top of the sock and it looks smart to match the cuff, heel and toe together. Both pairs are very comfy and will get more wear this winter. I have just finished these pastel beauties using Stylecraft Head over Heels All Stars. 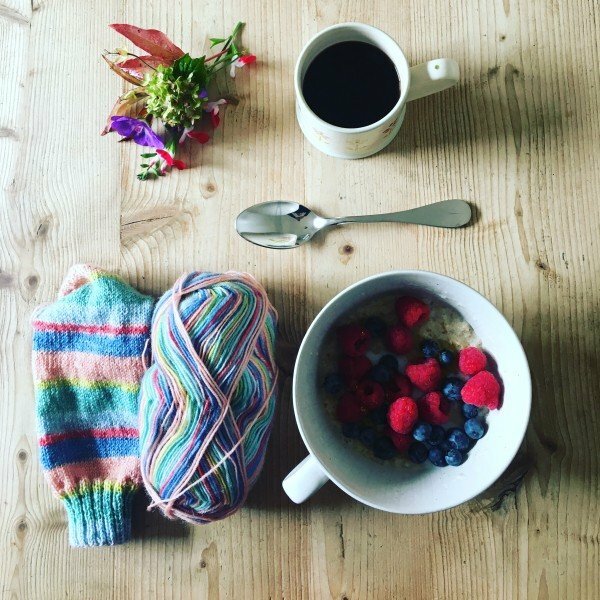 As Stylecraft Blogstars we all got an opportunity to select a range of colours to create a new sock yarn. Sadly my choice didn’t make the grade. 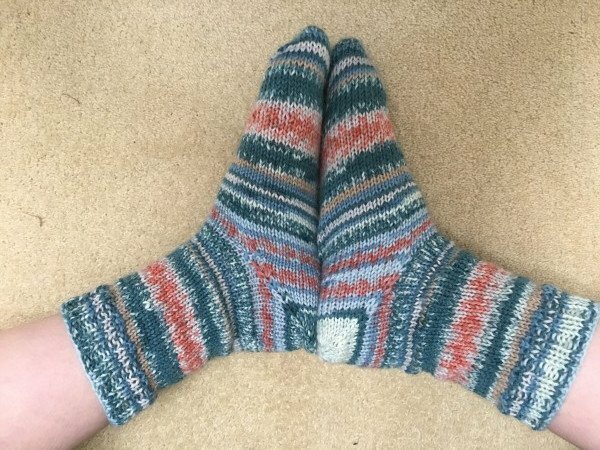 No matter, because I am delighted to have made these socks using Lucy’s design (Attic 24). 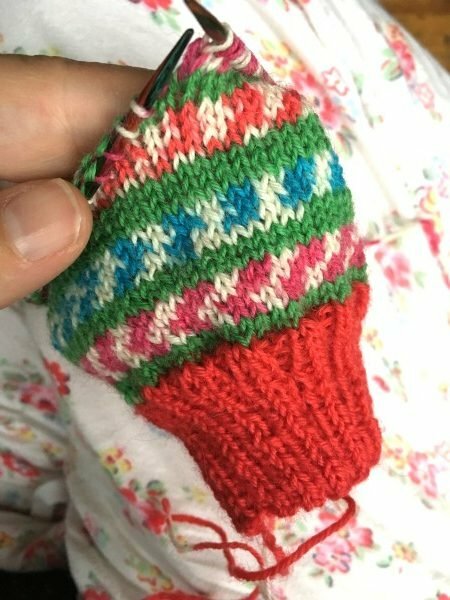 I thought I would extend my heel knitting repertoire and used the Sweet Tomato Heel method, (cute name). Experts will tell you that this method might not be very hardwearing. But I thought it looked nice with the colour stripes. Surely, I have made enough now! No sir. I have two pairs currently on the go. 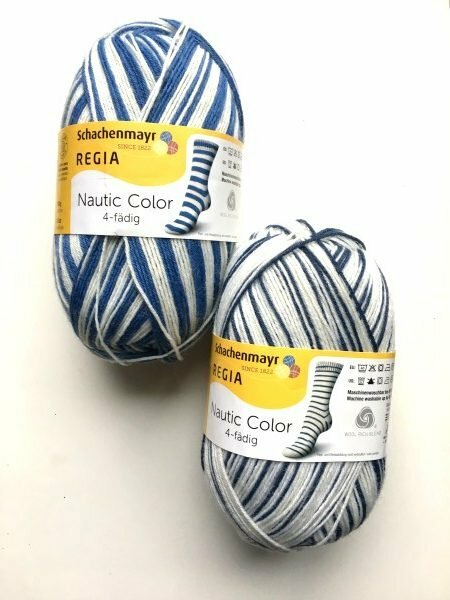 A limited edition sock yarn by Regia, called Nautic. There are five designs in this range and it is almost as if they were all designed for me! In fact, Christine messaged me to say she had spotted a ball and thought of me immediately. I have completed the first sock and will begin on the second this weekend. I am also hoping to complete a pair of Christmas socks using the new Fairylights by West Yorkshire Spinners. These look rather jaunty and I am not quite sure who will receive them yet. So there you go, for a non-sock knitter at the beginning of 2018, I am rather loving my new yarn hobby. As of yet I have tended to take a simple approach to the design. Perhaps in 2019 I might look to expand my skills. But as for now. 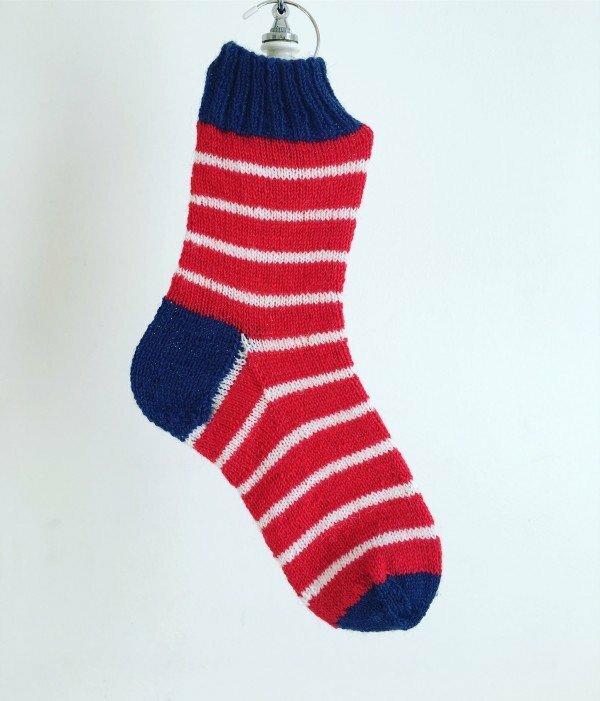 Bring on the chill – I am ready with the woolly socks! 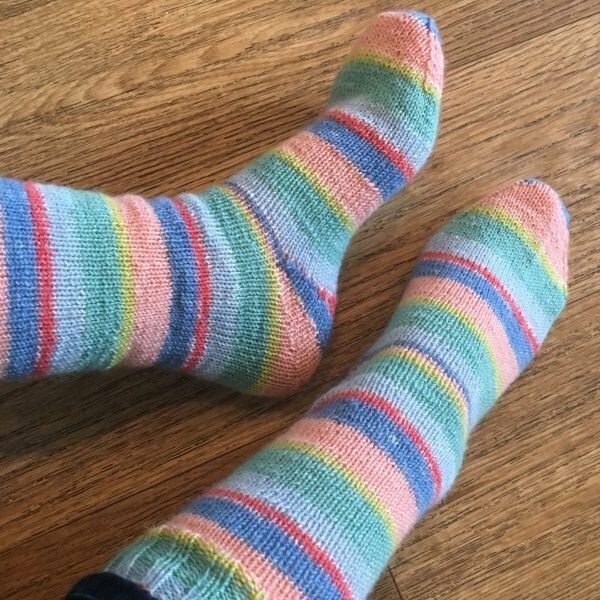 This week I will celebrate sock knitting by doing a book review of two great sock books and a give-away of some sock yarn – so stay tuned for an opportunity to get a ball of great yarn.